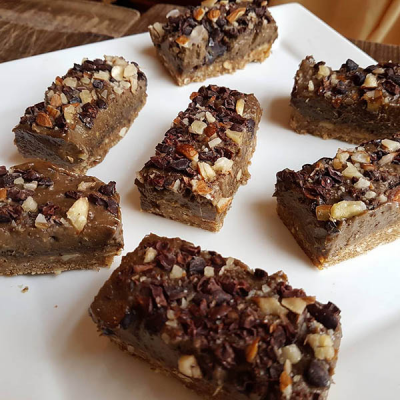 Delicious and highly nutritious, with only nuts, fruits and Raw Protein Powder. Mix well the almond butter with the RawProtein Powder, the bananas, 1/4 teaspoon vanilla bean powder and a thumb of fresh ginger until you get a creamy consistency. Pour on top of the base and top with crushed almond and crushed cacao beans. Freeze overnight and enjoy!